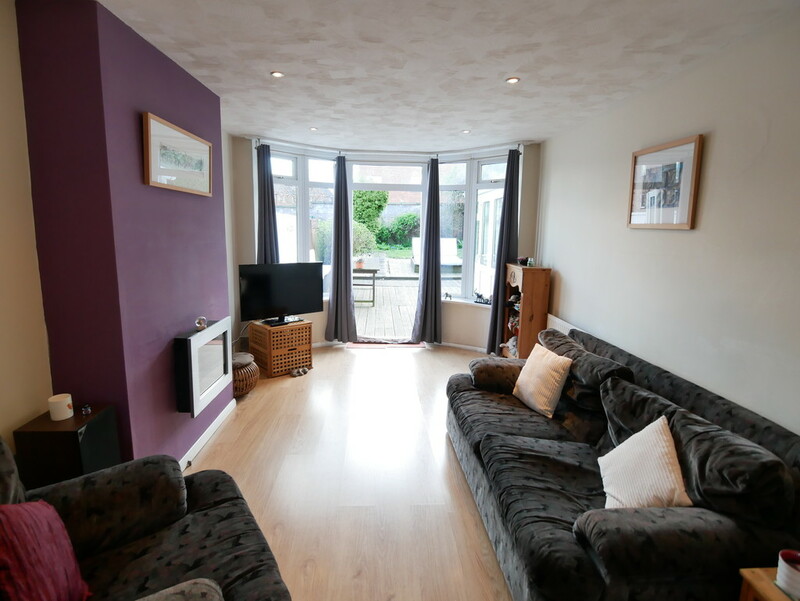 Well presented semi detached house in a popular residential area and close to many amenities. In brief the property spans two floors and briefly comprises an entrance hallway, dining room with bay window, living room with French doors onto the garden and an open plan kitchen and conservatory also with French doors onto the garden. To the first floor are three bedrooms and a modern bathroom. There is parking at the side and a low maintenance garden to the rear. Viewings are highly recommended to appreciate the property on offer. KITCHEN/DINER 22′ 4″ x 7′ 2″ (6.82m x 2.20m) Fitted wall and base units with a work surface incorporating a one and a half bowl sink unit with a stainless steel mixer tap. Fitted double oven, five ring gas hob and extractor hood. Integrated fridge and freezer. Radiator, tiled splash backs, laminate floor and open plan to the dining conservatory area with uPVC double glazed windows to the rear and French doors onto the garden. LIVING ROOM 15′ 10″ into bay x 10′ 10″ to the back of the chimney breast(4.83m x 3.31m) uPVC double glazed walk in bay with French doors onto the garden at the rear, laminate flooring, inset spot lights, radiator and wall mounted gas fire. BATHROOM Modern refitted suite comprising a bath with an electric shower over, pedestal wash hand basin and low level WC. Radiator, inset spot lights, tiled walls and floor. uPVC double glazed opaque windows to the rear and side. BEDROOM ONE 13′ 3″ x 10′ 11″ to the back of the chimney breast (4.06m x 3.33m) uPVC double glazed window to the front and a radiator. BEDROOM TWO 10′ 11″ to the back of the chimney breast and wardrobe x 11′ 2″ (3.34 m x 3.42m) uPVC double glazed window to the rear, radiator and built in wardrobe housing the wall mounted Worcester combination boiler. BEDROOM THREE 7′ 2″ x 7′ 5″ (2.20m x 2.28m) uPVC double glazed window to the front and a radiator. OUTSIDE Parking to the side and gated access to the south facing rear garden. The rear garden has both lawn and decked patio area with built in seating and a shed.